SANAA — A U.S. drone killed three suspected al Qaeda militants in east Yemen, a local official said, the third strike within 24 hours as Washington intensifies efforts to eradicate al Qaeda's Yemeni branch after recent warnings of possible attacks. The three men were travelling in a vehicle in the province of Hadramout in an area called Ghail Bawazeer, 45 km (28 miles) from the provincial capital Mukalla, when they were targeted by the drone on Thursday night, the official told Reuters. 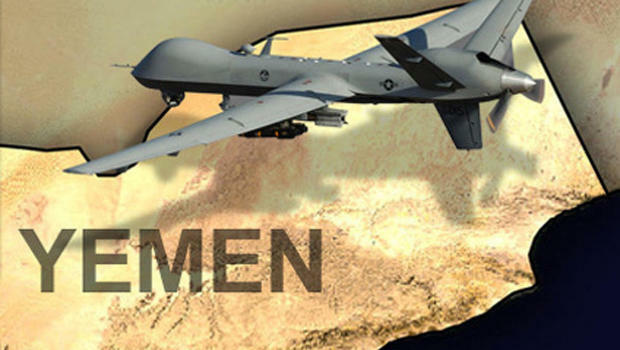 Earlier on Thursday, 14 militants died in two drone strikes in the central Yemeni province of Maarib. At least 28 al Qaeda suspects have been killed by drones in the past two weeks, a marked increase in the frequency of such strikes. AQAP has carried out attacks in Saudi Arabia and has made several attempts on U.S. targets. In 2009, Nigerian Umar Farouk Abdulmutallab, who had been trained by AQAP in Yemen, tried to blow up a Detroit-bound airliner with a bomb in his underpants.